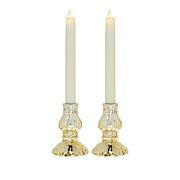 These matchless push button candles put out a realistic flickering candlelight effect with the simple push of a button. No more switches on the bottom, and no lost remotes to worry about. See how fast you can set the mood with this unique On/Off technology. Made of a thick layer of real wax, you can safely enjoy realistic LED scented candlelight without the mess associated with a traditional candle. The included timer allows you to set the candles to turn off and on at the same time every day. These sets are perfect for your own home decor or to give away as a gift. 2 Ivory LED Flameless Candles - 3.15" x 4"
2 Ivory LED Flameless Candles - 3.15" x 5"
Ivory LED Flameless Candle - 3.15" x 6"
I can't speak to the battery life yet, but they're the brightest, most realistic battery operated candles I've ever owned or seen. The flickering is truly random in movement and brightness. The timer is easy to set. Just turn the candle on, then press the button again and hold til it blinks, then release the button. I love them! Very nice. Gifted to family members. Love these!!!!!! Definitely buying more. They're bright, very believable and I never have to move them to turn them on. Great price too! I really love this push button design. I have them come on at 430pm and five hours later they shut off. They are a night light so I don't come home to a dark house at the end of the work day. I have them all on in two different rooms.